The movie chain just announced the “Ticket Tuesdays” deal via email. Sent exclusively to their AMC Stubs members, the discounted tickets are only good for Tuesdays and for a limited run. Every Tuesday from August 15th until October 31, 2017, members can purchase $5 movie tickets at the box office. The promotion is good at any AMC or AMC CLASSIC theatre as well as select AMC DINE-IN™ theatres through. The deal is only for regular format movies, so there will be additioanal charges for premium formats like IMAX, Dolby, xD, 4D or RealD. As with all deals that sound too good to be true, you have to read the fine print as exclusions apply. You can see the terms and conditions at the bottom of this post. 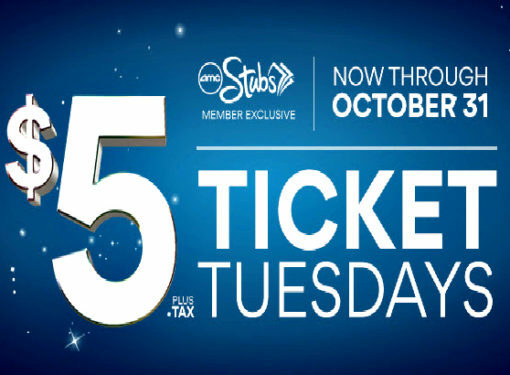 As soon as you join, you can enjoy this $5 Ticket Tuesday offer at the box office! You’ll also start earning points toward $5 rewards and get a FREE refill on your large popcorn purchases. Once you finish registering, they’ll send you a QR coupon code that you can flash at any AMC on Tuesday to get in on the promo. You really don’t have anything to lose by joining as the savings aren’t insignificant. For example, if you’re walking up to any New York City AMC box office without this promotion, you’ll be paying between $14 and $18 for a regular price ticket. With this promotion, you’re getting 60-75% off a ticket! Not only that, you can get a special combo on $5 Ticket Tuesdays. Get a popcorn and a “Coca-Cola” for just $10 before tax (just watch those popcorn calories). Upcharges for premium formats, special events and exclusions apply. 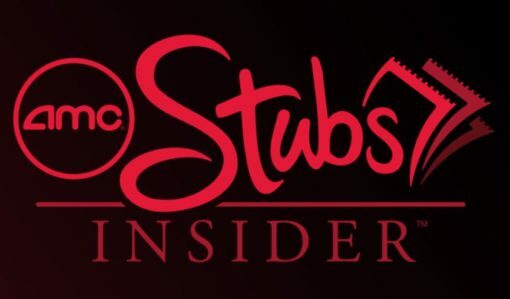 $5 Tuesday tickets are available for AMC Stubs members only at participating AMC, AMC DINE-IN and AMC CLASSIC locations for a limited time only. Valid 8/15/2017 through 10/31/2017. Offer is available at box office and AMC Stubs membership must be presented at time of purchase to be eligible for discount. Offer not combinable with any other ticket discounts, including AMC Stubs member Tuesday ticket discounts. Upcharges for premium formats and exclusions apply. Tax not included. Members who register for promotion will earn double points on qualifying movie, food & drink and AMC Stubs Premiere membership purchases between date of registration and Oct 31, 2017. Double points defined as a 100% bonus on base points earned on the qualifying transactions. Transactions must have members AMC Stubs account # attached. All Bonus Points will be awarded in 7 to 10 days following the completion of a qualifying visit. AMC associates are not eligible to participate in this Bonus Point promotion.